Two major themes of the Orion 2.0 release are improved import/deployment and node.js support. These are large scale efforts and their benefits will mostly come in future builds. In the meantime, here are some goodies in the 2.0 M1 milestone for your holiday entertainment. Check it out now on OrionHub, or download the server. Work is well underway to create a simple Orion server running on node.js. The small footprint of this server makes it suitable for embedded devices and potentially very large scale cloud scenarios. 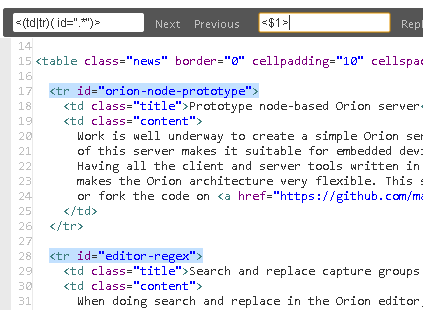 Having all the client and server tools written in the same language also raises some new possibilities and makes the Orion architecture very flexible. This server is not yet ready for prime time, but you can check out or fork the code on GitHub. You can now narrow down a global search based on file type. Open the drop down menu in the search bar, and select a file type from the list. You can search on file type only, or a combination of file type and search keyword. 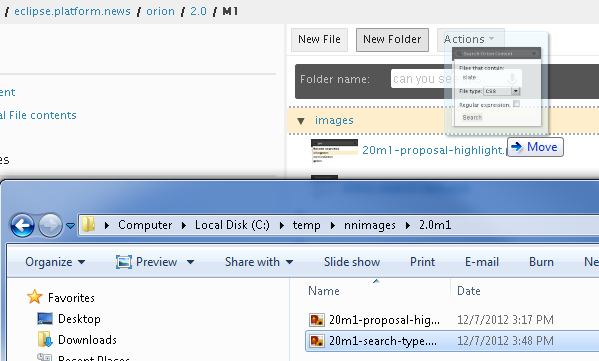 You can now drag files and directories directly from your desktop into Orion. This feature is fully supported only on Chrome. On Firefox you can drag individual files from your desktop, but not folders. If you’re on Internet Explorer you can use Import local file from the Actions menu. We are investigating support for drag and drop on Internet Explorer 10. The Orion editor has been improved on Android. 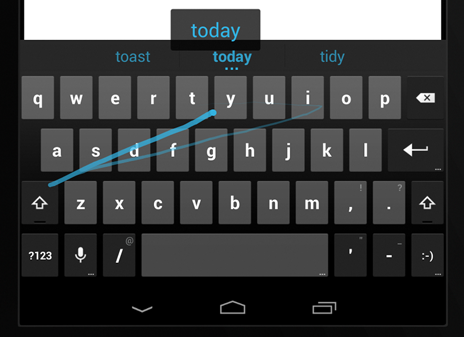 All forms of input are supported, including virtual keyboard, voice input, gesture typing in Android 4.2, and of course physical keyboards. Editor selection and copy/paste are supported as well. Orion currently supports only mobile Chrome browser on Android 4.1 or later. You can now change the editor font size from the Editor Theme settings tab. 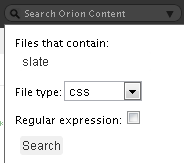 Orion has a new editor theme called Prospecto. You can customize or change editor themes from the Settings page. A plugins command for working with Orion plugins. This command has sub-commands for listing, installing/uninstalling, reloading, and enabling/disabling plugins. 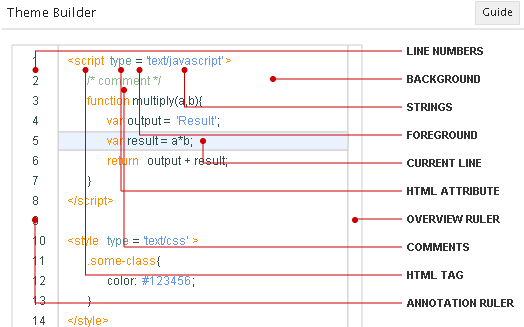 Type help plugins on the shell page for more details. A service command for listing the available instances of a given service. 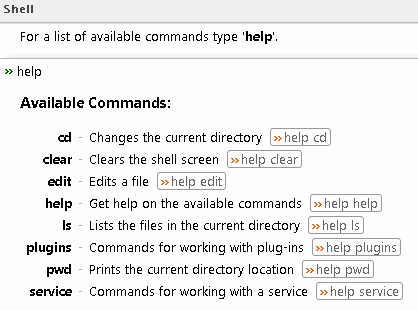 Type help service on the shell page for more details. You can now open a shell page on a particular directory from the Navigator page. Select any directory, and select Open in Shell from the Related menu in the top banner. When entering a search term in the search bar, matching segments from previous searches are now highlighted in the proposal list. Communication with OrionHub now occurs over HTTPS, providing authentication and encrypted communication with your hosted tools. Orion itself has supported HTTPS for awhile, but it was recently deployed to the OrionHub server in particular.